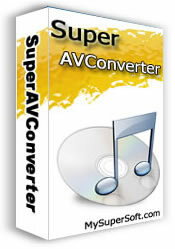 SuperAVConvertor is an excellent multimedia conversion tool for CD ripping, audio conversion, video conversion, audio-video mixed conversion, audio/video splitting or merging. SuperAVConvertor is an excellent multimedia conversion tool for CD ripping, audio conversion, video conversion, audio-video mixed conversion, audio/video splitting or merging. The encoder embedded in SuperAVConvertor is international advanced, it supports many kinds of CPU instruction sets, such as MMX, 3D Now! SSE and SSE2. In this way, a faster conversion speed is possible for you. What is more, SuperAVConvertor supports so many media formats that it can almost handle whatever conversion job you want, SuperAVConvertor will be your best choice! Support conversion of CD music format to digital music formats include WAV, MP3, WMA, OGG and etc; Support conversion based on user-selected options; Support batch conversion; Support multi-CDROM. Support audio formats include WAV,MP3,OGG,WMA,APE,AAC,AC3,RMA; Support extracting audio from AVI/ VCD/ SVCD/ DVD/ MPG/ ASF/ WMV/ RM/ RMVB/ MOV/ QT/ 3GPP/ MP4/ SDP/ YUV video formats; All the audio formats above can be saved as WAV/MP3/OGG/WMA/APE/AAC formats; Support conversion based on user-selected options; Support batch conversion as well. Convert Video & Audio quickly The encoder embedded in SuperAVConvertor is international advanced, it supports many kinds of CPU instruction sets, such as MMX, 3D Now!, SSE and SSE2. In this way, a faster conversion speed is possible for you. Support batch conversion Select all files you want to convert and the software will automatically convert them one by one. Excellent image and sound quality Using this converter, you will get the movie formats you want with excellent image and sound quality. Personality Logo Add Overlay Image to your video file.